A weekly newspaper which was relaunched just six months ago by Sir Ray Tindle is set to expand with the creation of two new editions. 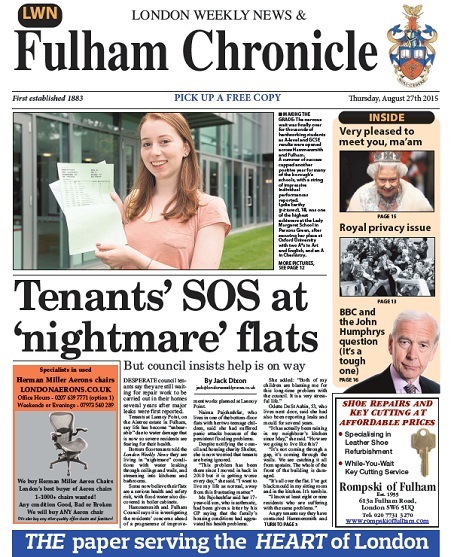 The Fulham Chronicle, which was first established in 1883, was relaunched in February by Tindle Newspapers and the new editions will hit the streets in September for the Hammersmith and Shepherd’s Bush areas. The move comes after the Chronicle was awarded a three-year contract to publish public notices by Hammersmith and Fulham Council. It is the latest in a series of new titles and editions by Sir Ray in the capital and follows the launch of the London Weekly News last November. This week’s edition of the Fulham Chronicle. At the same time, he also revived three defunct titles – the Westminster and Pimlico News, Kensington News and Chelsea News. Tindle Newspapers will launch the two new editions of the Fulham Chronicle in the first week of September and one extra reporter will work on the titles. The Chronicle has a distribution of 18,400 at present, of which 15,000 are door-to-door. The decision by the council to award its public notices to the paper followed a series of meetings between the newspaper and council officials. Philip Evans, joint MD of the London titles, said: “This was good news for the local press. “It is unusual that the paper, that was re-born only six months ago, although first established in l883, should win such a prestigious contract. Sir Ray owned the Fulham Chronicle many years ago but it eventually ceased publication as a stand-alone title. In February, Sir Ray said his stable of 38 titles in London were approaching 1m readers. What…a Labour council awarding a three year contract to a right wing Tory like Tindle? Where is Jeremy Corbyn? Where are all the comments from journalists on HTFP who complain about “Pravda” councils doing down the commercial press? What if stories come along that the councillors don’t like? “He who pays the piper calls the tune”…of course, that old adage doesn’t apply in this case. These strange bedfellows can cuddle up together and the readers will be none the wiser. I’m not sure why it’s good news. Other Tindle titles – like the once great South London Press – are pretty pathetic. Local free sheets and blogs much better. It’s a mystery as to how the “SLP” survives with its current editorial team. Local and regional papers have the capacity to survive in todays rush to go digital, the formula of very local news and advertising is what its about, Good on Tindle for picking up this contract.